When my niece first saw my artwork, she asked how I could bear the part with any of it? I told her that I obviously couldn’t keep everything…I wanted others to enjoy it…working with my hands was essential for me…and that this was my business. But there I was, leaving my handiwork – and lots of it – 200 miles away, and it felt different this time. 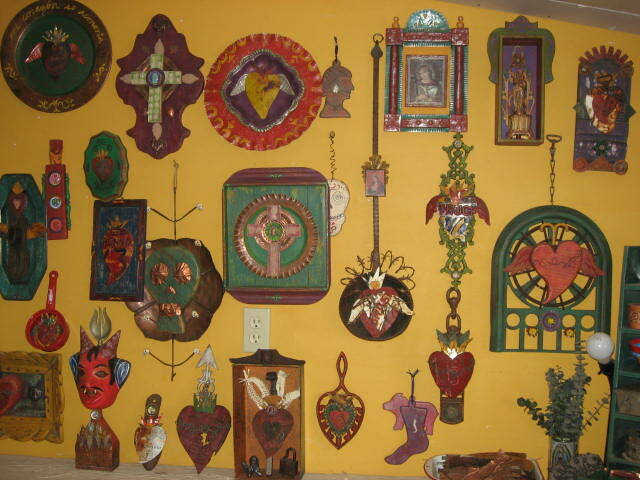 I’ve been making my little folk art shrines for over 3 years now and finally launched my website in January. It’s long been my goal to step things up a couple of notches and to take some risks. 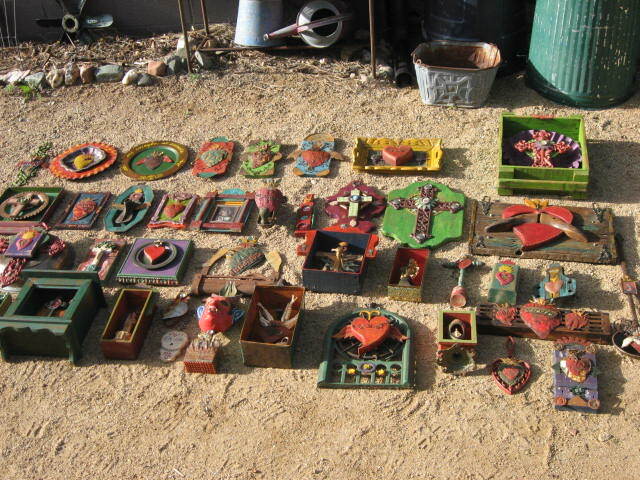 But here’s the thing…I offered up pretty much all of what I had, and the owner took virtually everything! So what’s the problem? I guess I’m mostly freaked out about not having any backlog, and perhaps, even after my logical explanation to my niece, I wasn’t really ready to let some of the new pieces go yet. Or maybe the real uneasiness stems from the subtle, yet equally alarming fear of failure verses real success? Still, I did realize that THIS was my “something special” and the new gallery deserved the best I had to offer. Why would I want all that stock sitting in my studio, anyway? This enabled room for the NEW, and in my tiny studio, that’s no small thing. ~ by Dawn Elliott on April 19, 2011. You have some wonderful things there! I would be hard put to part with them too! but you are right they are out there working for you and your future!thanks for showing us all the goodies! Wow Dawn. Sometmes you gotta do what you gotta do. Wow, those are all beautiful works of art. Aren’t you doing what you set out to do?? All these shrines are going to be very happy in someone’s home. I know I definitely would be happy. Cheer up Dawn, just another step in your journey. Before long you’ll have you little studio bursting at the seams. Congratulations!! and I do mean that. I’m sure you took pictures of all of them for future reference, so that’s a good thing. Take care. isn’t life all about letting go and letting in? we may have a season for lent and choosing carefully what we will lay down. and the laying down is all about the deeper wisdom that will find our hearts in moments just like this. life has its own seasons…for which lessons like these are trial runs. i am caught up in a huge letting go season myself. It is the season of letting go and of rebirth…the one often portends the other. congrats on your new gallery! Dawn, as someone who has a hard time letting go (of people, places, and things) I applaud you!! I know the folks who give your beautiful pieces their new homes will love them! I am not an artist, but my mother is, and she always had a difficult time letting go of her favorite pieces. At 80, she still sometimes laments a piece or two that she wishes she hadn’t sold! But you’re right. Now you have lots of room to keep creating! Congratulations on this new phase! You let go!! so now more art can come out. It’s exciting. Others will be blessed! Hope your Easter was Happy!